Buy Maps from our Online Map Store. Covering a total area of 3,269,600 square miles, Australia is the smallest continent in the world. The continent comprises the mainland of Australia and proximate islands including Tasmania, New Guinea, the Aru Islands and Raja Ampat Islands. The estimated population of the continent (including population of Australia, Papua New Guinea and the Papua and West Papua provinces of Indonesia) 32,000,000. Also called Oceania, Australia is the lowest-lying human-inhabited continent on Earth. Australia, Papua New Guinea and portions of Indonesia are the three countries that make up the continent. Geologically, the continent extends to the edge of the continental shelf. This is the reason why New Zealand is not considered part of the Australian continent as it does not lie on the same continental shelf. 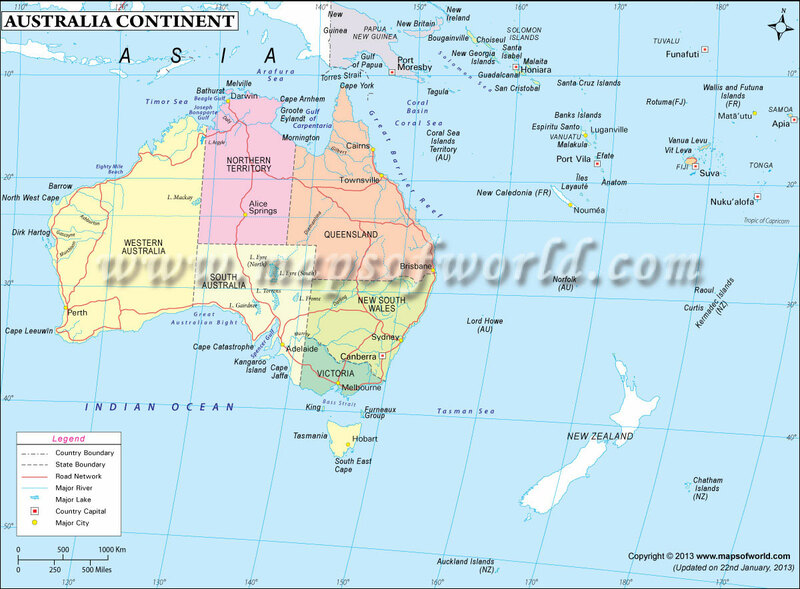 The Australia Continent Map shows the countries and their capitals, major cities, rivers lakes, road networks, state and country boundaries. Mt. Wilhelm in Papua New Guinea is the highest point in Australia; it stands at a height of 4,509 meters. Lake Eyre at 16m below sea level is the lowest point in the Australian continent. English and Indonesian are the major languages spoken in the continent. However, 269 indigenous Papuan and Austronesian languages and about seventy indigenous Australian languages are also spoken.